I’ve gotten some sketches done on my January journal page. 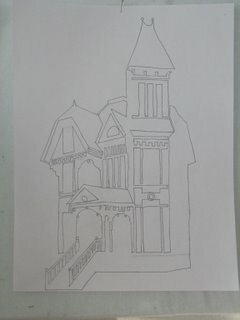 This is the house I decided to work with this month. Isn’t it incredible? The photo was taken in 1915 (and is used with the permission of ADNA). The house is no longer standing. 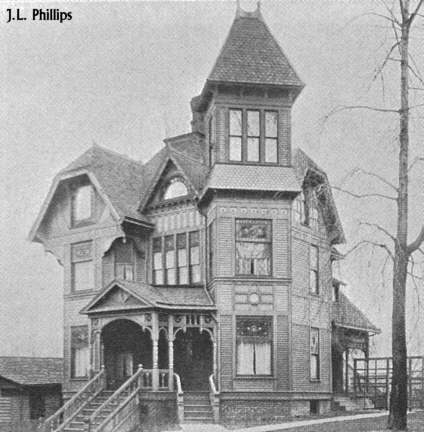 It was demolished in order to make way for the growing business district. What a shame! 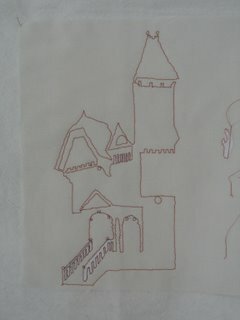 I just imagine that the 3rd floor room in the tower would make a great quilt studio! As best as I can figure, the house faced east and looked across the White River. So all those windows on the front would have been filled with morning sunshine and there would have been a great view of the Indiana landscape. 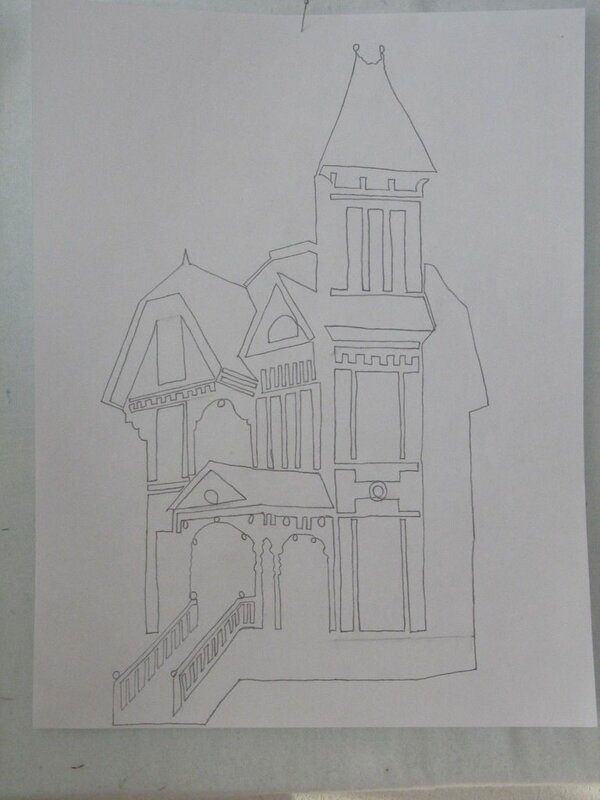 I did a little research on the internet and found that it has a lot of the features of a style called Stick Architecture; asymmetry, angularity, verticality, decorative “stickwork” (the wooden boards applied to the wall surfaces), Eastlake trim (the turned decorative work on the porch and hand rails) and square towers. It looks like the foundation is brick and the rest of the construction is wood. 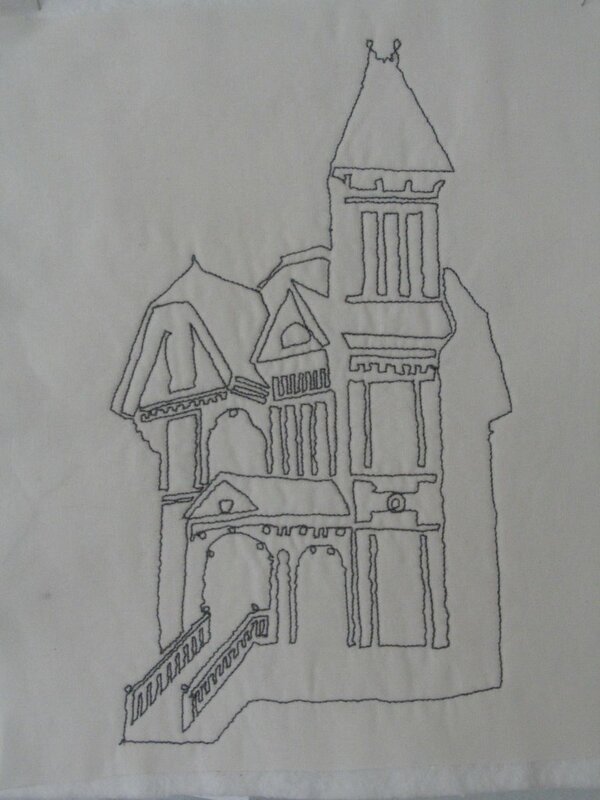 So, on to the sketches… Since I am focusing on line this month, I challenged myself to stitch the whole house in one continuous line. 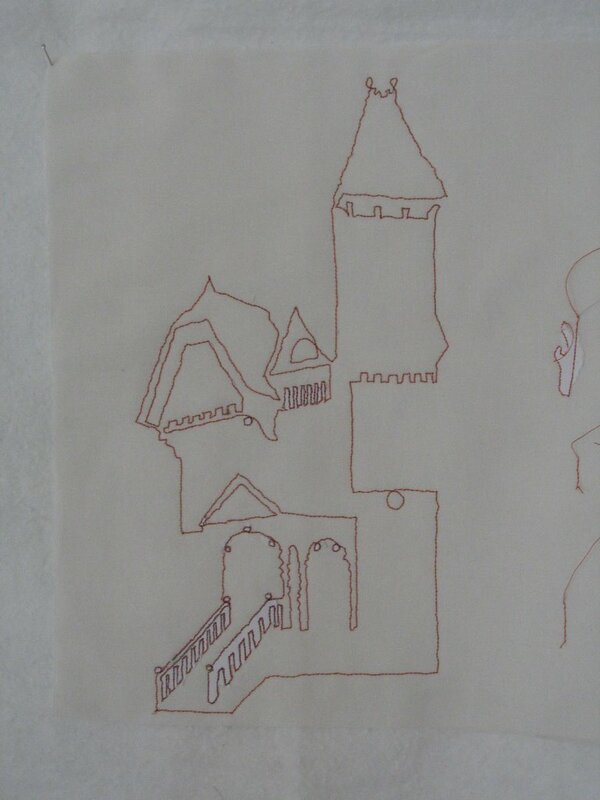 I don’t have very much experience with free hand machine stitching so I decided I’d better start out with pencil and paper. 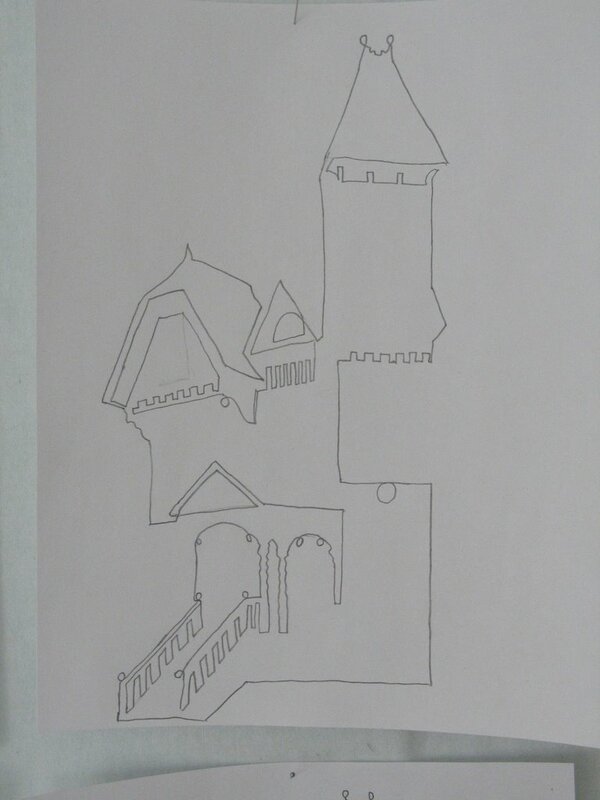 I started out very simple, trying to outline all of the important features. 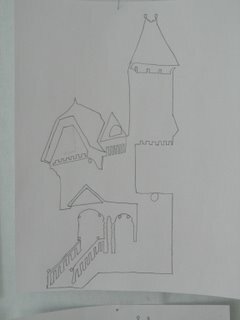 I kept adding more detail as I went on through a half dozen sketches, still using only one line per drawing. Finally, I figured I’d better start using the sewing machine. As I mentioned, I don’t have much experience with free motion machine stitching so I approached it with much trepidation. closely as possible stitching through all the layers; paper, fabric and batting. I used a 30 weight Mettler thread. I enjoyed doing it although it was difficult to sit that long and my arms and shoulders became very tense. Maybe with practice I will relax more? It was very difficult pulling the paper off and some of the stitches were pulled and distorted. So I decided I needed a new way of doing that. 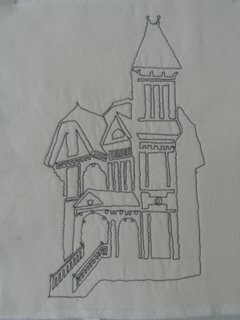 On this second sketch with the machine I put in a little more detail. I used a thread from Presencia that they call #16 (not sure if that is the weight?) It is a much thicker thread than I have ever used before on the machine but with a larger needle it worked well. 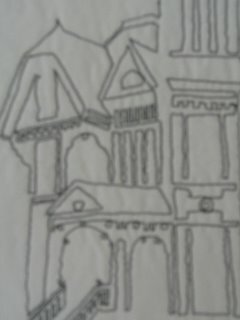 I drew this drawing with a fine Sharpy on a piece of Sulkey Solvey and taped it to the fabric sandwich to stitch over. That worked a lot better as I just rinsed the Solvey away with water after I was done. The lines are still very wavy. I’m not sure if I can improve on that at this small size. I’ll try practicing some more. I’m not sure where I will go with this next. I’m considering printing the photo on fabric and stitching the lines over it… any thoughts? Practice, practice, practice will definitely ease the tension in your neck and shoulders and you will get better each time at controlling the stitching as well — I think you did remarkably well though and didn’t feel like your stitches were wavy enough to bother me. 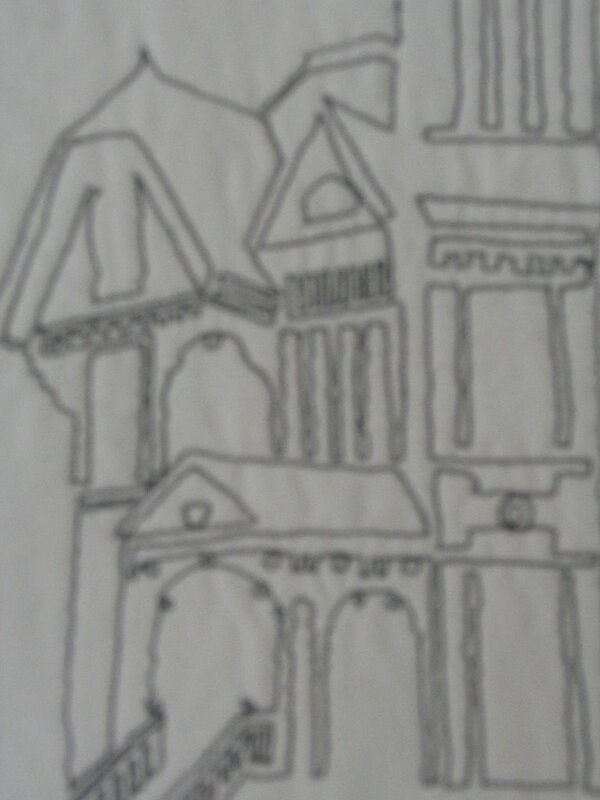 I think it would be wonderful if you would print the photo on fabric and do your line quilting on it! I don’t think you should print the picture and then outline it. Anyone can do that! What you are doing here is much more expressive and artistic IMHO! I am very impressed. What about a light color wash of paint or dye in the different sections or in the background. I love the silhouette look–reminds me of those scissor pictures of people’s faces. About the light wash of paint or dye, Debra took the words right out of my mouth. I have done thread “sketching” before, but only free-form, and I very much like the idea of sketching on paper first and using Solvy. 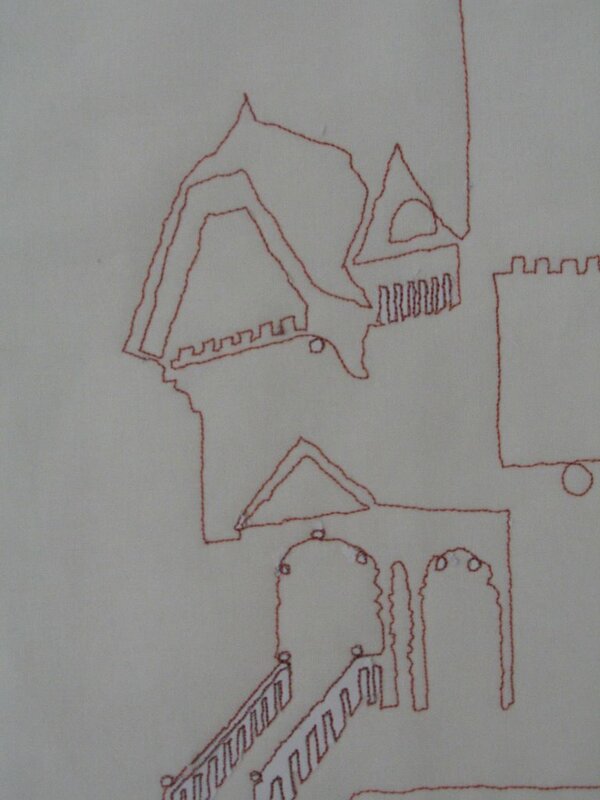 Doing the drawing, with stitches, directly on the fabric is very illustrative of the use of line. I’d prefer not to have you use the photo with it. I think what you’ve done is fantastic, it really catches the spirit of the house. I also find your discussion of the use of various types of stabilizers very helpful. I think you are doing a great job with the free motion stitching. and yes using the sulky solvy is a lot easier than ripping all that paper away. Deb, this is awesome! I think I would not approach this freehand but would try doing it with the feed dogs engaged. Ricky Tims uses a wash away stabilizer that leaves behind a thin poly web. He leaves it in the quilt. You could go to his website and find out what it is. I just love this piece. Thanks for sharing your progress. What an original idea! Like the others I’m impressed with what you’ve achieved already. I’m, glad you found a solution for the paper, i’ve had the same problem once but have never tried wash away stabilizer. In the book “The Passionate Quilter” by Michelle Walker is a portrait of a quilter named Jean Sheers who made sketches of remarkable houses and transformed them into patchwork paintings.